Elvira includes a host of template options allowing you to easily craft and style your design exactly to your requirements. We have ensured almost every element can be easily colored to your own taste. This option has been greatly improved with the introduction of 'Module Style Overrides' which allow you to quickly apply styling uniquely to each module position, all from within the comfort of your templates parameters. Assured to look great no matter how your users are viewing your site. Everything has been built upon a fluid and responsive grid, meaning your website will look great on every possible device and screen size. A collection of responsive options are available including a choice of two mobile menus and Custom CSS fields for each screen size. Your Elvira download will include a section of module extensions allowing you to easily implement various elements including carousels, pricing tables, icons and thumb galleries. Each fully responsive and super easy to set up in any module position. Layout control is important and we have made to sure that the options are available to easily organise your content with a host of layout controls. Options are included to easily amend module widths and padding, giving you the control you need to accommodate all possible scenarios. 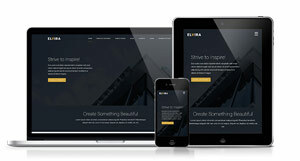 A clean canvas with countless opportunities, Elvira will be your go to template time and time again.